Kate Messner is an award-winning author whose books for kids have been New York Times Notable, Junior Library Guild, IndieBound, and Bank Street College of Education Best Books selections. She lives on Lake Champlain. The four chapters of this easy reader zip right along with a straightforward, breezy plot and two charming, mischievous mice leading the way...The art’s peppy lines and occasional plays on perspective support but never overwhelm the text. Short sentences, some stealthy repetition, and a host of sight words give plenty of scaffolding to young readers, and this might also make a diverting readaloud before a class trip. Messner's first in a new early-reader series (Fergus and Zeke will visit the school science fair next) is divided into four chapters and meant for those who are confident enough in their reading abilities to begin to make the transition to chapter books. Ross' digital illustrations add interest and break up the text, giving readers a mouse's-eye view of the museum and its fascinating exhibits...Here's to more adventures for Fergus and Zeke! Messner (the Ranger in Time books) lets readers live out their Night at the Museum fantasies through Fergus and Zeke’s explorations...Ross’s (Grimelda: The Very Messy Witch) energetic full-color cartoons run wild with the museum-as-playground theme, and Zeke’s decision to join Fergus in the classroom neatly sets up their next adventure. 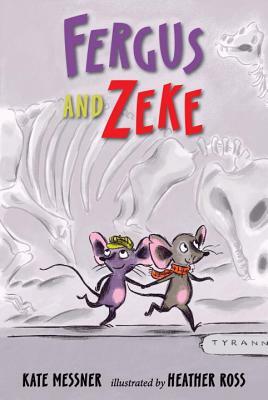 Small children of a compliant nature will find a kindred spirit in the mouse-hero of Kate Messner’s entertaining easy-reader ‘Fergus and Zeke’ (Candlewick, 52 pages, $14.99)...Cheery illustrations by Heather Ross add zip to this educational excursion for 5- to 8-year-olds.